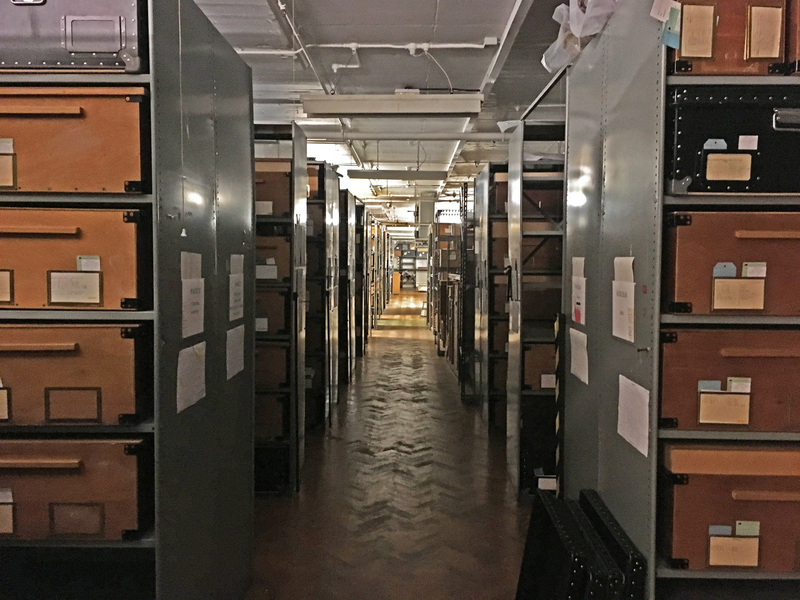 When the Museum's World Conservation and Exhibitions Centre was built, it meant that many objects could be moved from off-site stores to the Bloomsbury site. Assistant Storage Manager Jolyon Drew explains this intricate process. Warrior's headdress made of mud, ostrich feathers, metal and human hair. Uganda. Tucked away in a quiet road in north-east London, are two redbrick warehouses. They back onto Regent’s Canal where vestiges of their industrial past can still be found – large wooden doors open out into the air, from the first to the fourth floor above the canal. Behind them great iron engines linked to pulleys are suspended in time from the ceilings. An oversized lift shaft abuts the side of one building, and beside it is a large, olive green, steel shutter, big enough to fit a lorry through. Some of the storage of African objects at Franks House. This is Franks House (I and II), and since the 1970s it has been home to a large part of the collection of the Department of Africa, Oceania and the Americas (formerly part of the Department of Ethnography). Inside the store rooms, row upon row of wooden boxes containing 200,000 objects wait patiently upon steel shelves. It will not be long before each box is opened, the objects assessed and moved to the British Museum site in Bloomsbury. These objects are part of one of the largest museum storage moves project ever undertaken. 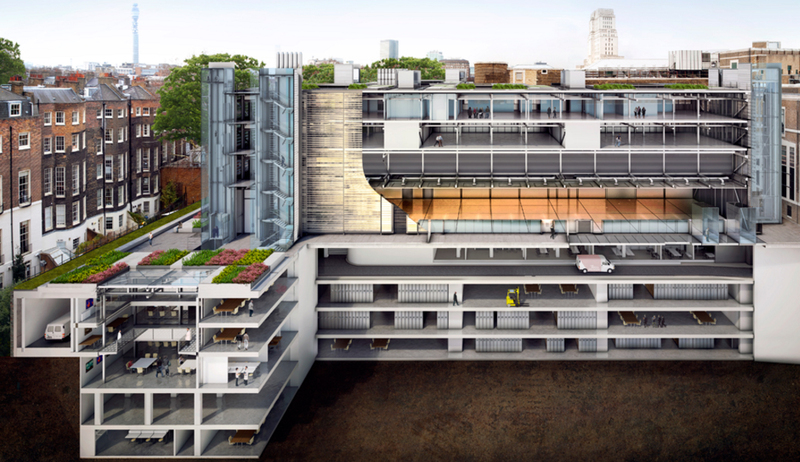 The British Museum’s World Conservation and Exhibition Centre (WCEC) has been designed to provide a safe and accessible space with closely controlled environments suitable for storage of organic materials. 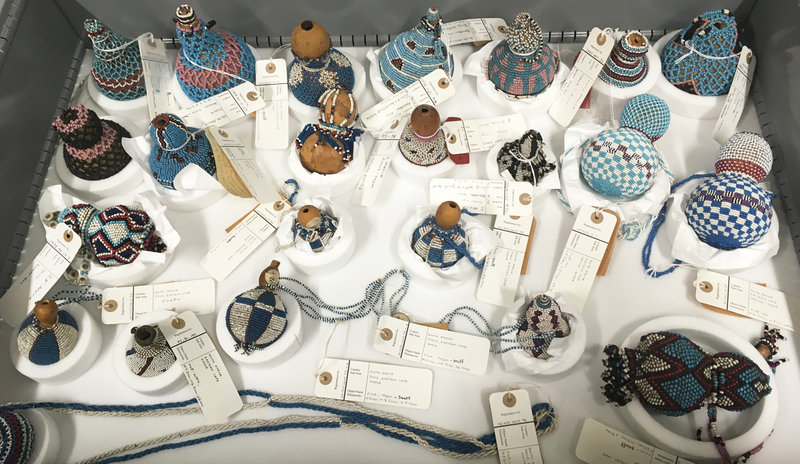 The main goal of the WCEC Storage Moves project is to transport the ethnographic collections of a number of Museum curatorial departments from their existing stores to the WCEC by 2021. Cross-section of the World Conservation and Exhibitions Centre at the British Museum. Throughout the process, the Storage and Moves team work with the collections management, conservation and curatorial departments to care for the objects, while also working with facilities management colleagues to build and maintain the new store and its specialist storage furniture. The project has a specialist team dedicated to the demands of the move. The curators work closely with Collections and Assistant Collections Managers to audit the objects and prepare them for the move. There are 15 Assistant Storage Managers who carry out the work of unpacking, inventory updating, repacking, transporting, and installing the objects. They are supported by four Conservators who treat the objects’ immediate problems and take on larger groups of objects which require more specialised work. They are all overseen by two Storage Project Officers and a Senior Conservator, while the overall project is managed by the Collections Project Manager. 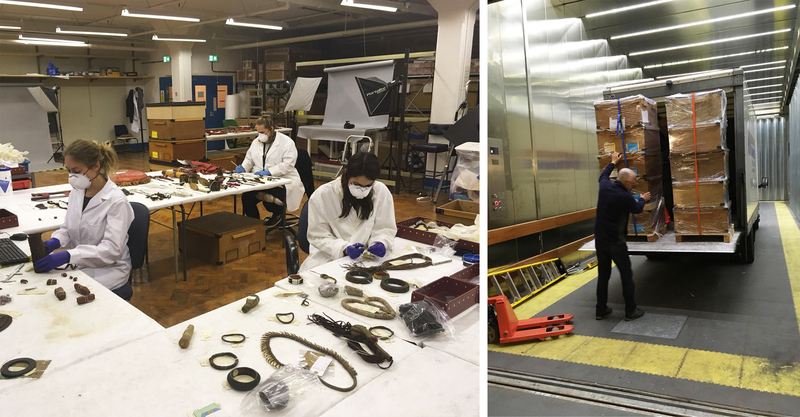 This team brings together a wealth of experience in object care from the Royal Armouries to the Natural History Museum, and more. The project has allowed many graduates to enter the heritage sector as well as several groups of volunteers, some of whom have since joined the team as employees. 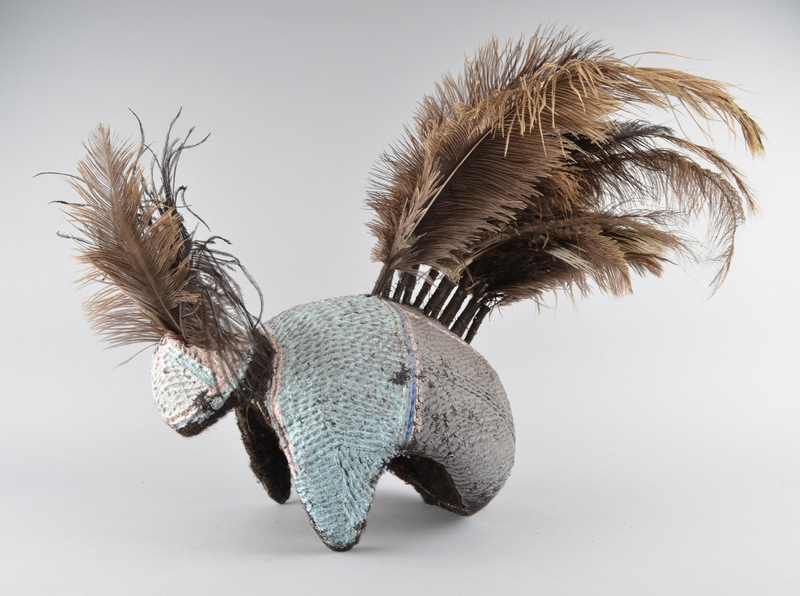 Warrior’s headdress made of mud, ostrich feathers, metal and human hair. Uganda. The team is currently processing the 50,000 or so objects from Africa that need to be moved. The special feature of this group of objects is the large amount of organic material, from skins and feathers to plant fibres and wooden objects which are sensitive to fluctuations in temperature and humidity. During their historic storage in the Museum they have been subjected to various anti-pest treatments and, as a result, they can be hazardous or require a range of specialist treatments before being stored again. Condition checking and moving objects to the new storage facilities. The process of moving objects from their old stores to the new involves a number of stages. First, all objects are audited, condition checked, measured, and photographed for the Museum’s collection online. This digitally accessible record ensures that essential information about each object is quickly available to both the public and Museum staff. Then, conservators carry out treatment on objects, from cleaning to stabilising the structure of vulnerable objects. Next, all objects are packed into boxes and put through one of three treatments: freezing, anoxia or quarantine. This ensures that the threat of pest issues is completely removed. The final stage is transporting the objects to the WCEC where they are unpacked and placed in their permanent location. The team create bespoke, specially designed supports for fragile or unstable objects. 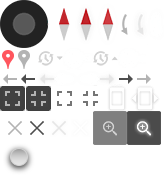 Each object is given a new location code, which is entered on the collection online to ensure any object can be easily found just as they could be in their old location. A drawer of African objects in the new storage setting. Every day, more and more of the collection is moved into its brand new home in Bloomsbury. Already, the objects are benefiting from the new storage facilities and the attentions of the team. Over the next few years, the Storage Moves project will continue to help the Museum care and conserve the collection so that it can be enjoyed and understood by our worldwide public for generations to come. The WCEC Storage Moves project is generously supported by the Heritage Lottery Fund.